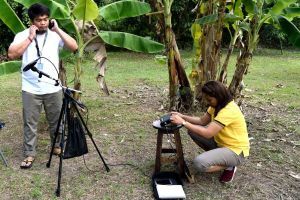 Nine trainees completed a six week recordist training course held in Thailand late last year. They came from Bangladesh, Nepal, Myanmar, Philippines and Thailand. We look forward to many life saving and life transforming messages being produced by them over the coming years. It is exciting! Elise Cooper is a trained educator. She has been working on the course curriculum, training the trainers, and producing online content for several years now. As a teacher who knows little about recording she has the challenge of enabling recordists, who know little about training, to train well. We praise God as He has brought together a team of educators to produce the content, and a team of trainers with a real heart to teach the trainees what they need to know. Pray for these two groups as they work together for the good of the trainees they all want to see as well prepared as they can possibly be for the work they do. Graham Schabel is responsible for our recordists' kits amongst other things. He spent time with nearly all the trainees before the course. He taught them how to use the new audio recorder. He made sure their computers were working well and they could access all the computer systems they need. At the training course he was able to fix any technical problems as they occurred. This enabled the course to run smoothly. All the trainees had been on a recording trip before the course. Their directors helped them to prepare. Some trainees studied English before they came. They all took the time to do their online courses and communicate with each other and those GRN personnel who will help them in their role as recordists. They felt they knew each other and the trainers before the course, which was a real bonus. The trainers met together in Australia a few months earlier, where they looked at the curriculum and made plans for the course. This helped the trainers to prepare their sessions and ensure that the important topics were identified and included in the course. The trainers on this course came from Kenya, UK, Australia and Thailand. 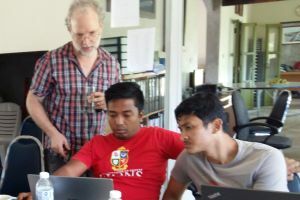 The course was held in the GRN Thai office. The Thai team were almost completely dedicated to the running of the course for the six weeks. They provided meals, accommodation, transport, entertainment and help when needed. The Thai office had lots of work to do beforehand too. Helping the trainees and trainers obtain visas was a challenge and far from straightforward. They did an awesome job with wonderful reports being received about their hospitality. 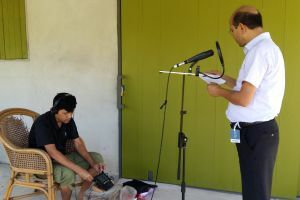 Jon Rulison is both the Thai Director and co-ordinator of recordist training. He not only oversaw the efforts of the Thai team but he also oversaw the running of the course. His life was made even more interesting with last minute changes to the available trainers which meant late changes to the course program. Over the six weeks of the course, the Australian GRN office prayed for the training course daily. It is so exciting to see real progress being made in an area where we have been praying and working hard for several years. Please pray with us as we pray for the trainees as they go out and record and put their training into practice. 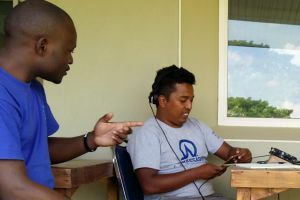 Pray too for God to use the recordings they make to bring people to faith and build God's Church.